The Rwa - Site Jimdo de baroin-catherine! The Rwa (Varwa) are Bantu farmers known as Meru (Wameru) in Tanzania, but in their own Bantu language, ki-rwa, they call themselves Rwa (Nrwa in singular, Varwa in plural). In the 17th century, they settled on the south-eastern slopes of Mt. Meru (4585 m), facing Mt. Kilimanjaro, where they now number about 250 000. From a cultural and linguistic point of view, they are close to a much bigger and better known group, the Chaga of Mt. Kilimanjaro. Like them, they grow coffee as a cash crop, together with bananas and other food crops, mainly maize and beans. Livestock is bred in zero-grazing, because land is scarce on this densely populated mountain. Since the fall in world coffee prices, the proximity of the town of Arusha has been advantageous for the Rwa, as they can sell their farm products, as well as find some available jobs. At the beginning of the 20th century, the Rwa underwent German colonization and started converting to Lutheranism. British colonial rule then took over until the independence of Tanganyika in 1961. Today, most Rwa are Lutherans and well-read. All of them speak Swahili, the national language in Tanzania, and a few speak English, the second official language. Yet the Rwa remained with their former social organisation, a strongly gerontocratic one, with patrilineal clans, age-groups, and a centralized chieftaincy. The clans rule family affairs and land inheritance, which is a most crucial issue now that land is scarce due to demographic pressure. As for the age system, it delineates groups of age mates who grow together in the successive stages of life. Advised by their "fathers", they first become warriors (now in charge of community works). They are educated to respect their elders and matrimonial rules. 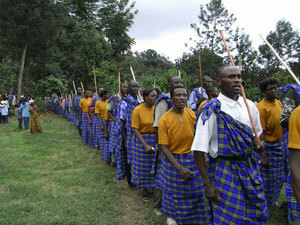 Each clan and each age-group appoints its local leaders and a paramount one. The top leaders make up a Central Committee of 20 to 30 men headed by a supreme chief (Nshili nnini). They preserve law and order, and make sure to enforce the Rwa Constitution, a written document where customary law is carefully recorded. BAROIN, C. 1998 . "Introduction et culture du café chez les Rwa de Tanzanie du Nord", CHASTANET, Monique (éd), Plantes et paysages d'Afrique. Une histoire à explorer, Paris : Karthala & ORSTOM, pp. 529-549. BAROIN, C.2001 . "De la bière de banane au soda en bouteille. Religion et boisson chez les Rwa du Mont Meru (Tanzanie du Nord)", Journal des africanistes, 71-2, pp. 77-94. BAROIN, C.2003 . 2003 "A brief history of a neo-traditional form of chieftaincy and its "Constitution" in Northern Tanzania, 1945-2000", in Wim van BINSBERGEN, in collaboration with Riekje PELGRIM (ed), The Dynamics of Power and the Rule of Law. Essays on Africa and beyond in honour of Emile Adriaan B. van Rouveroy van Nieuwaal, Leiden : African Studies Centre, pp. 151-166.